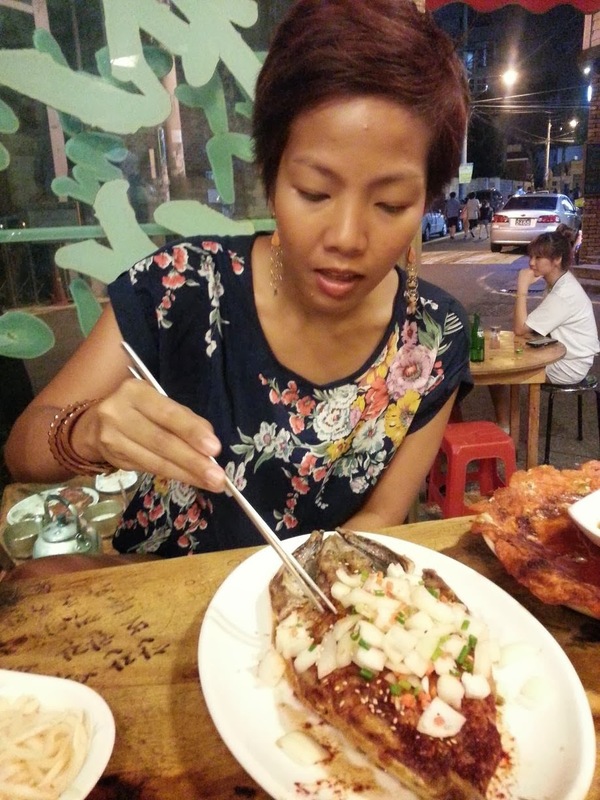 I looked forward to every meal time in Korea as much as I did the sights. Well, okay… I admit that’s the case in every country I visit. 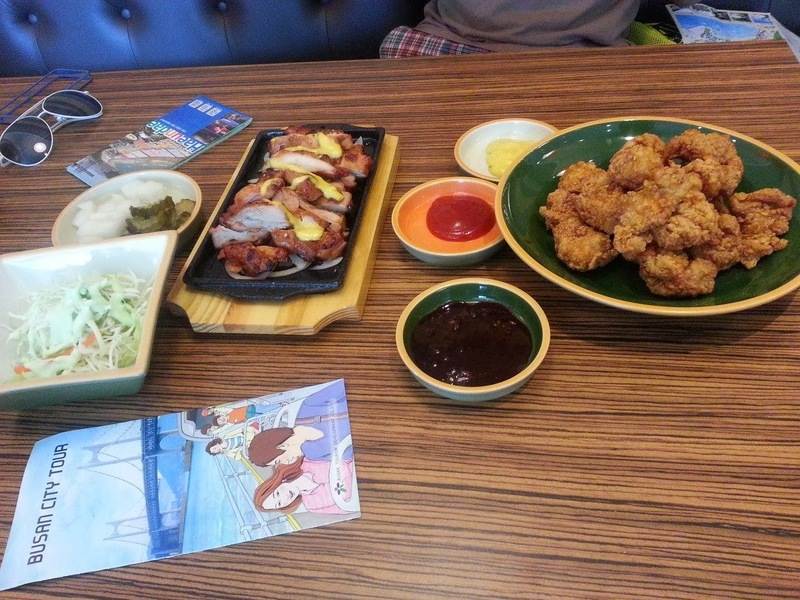 :D Here are some of the dishes you shouldn’t miss when in Korea. Soju is a distilled alcoholic beverage that Koreans consume neat. I have tried several times to get accustomed to its flavor but all those times I have failed. I just find it too strong. Luckily, there are several ways to make soju easier to take. 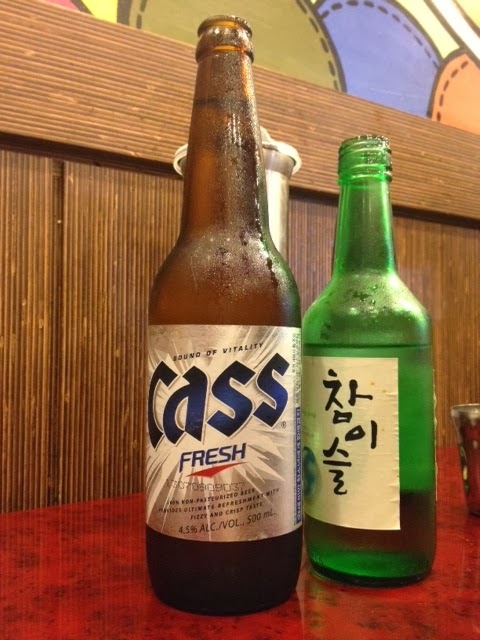 One is somaek – a combination of soju and beer. The concoction I prefer is flavored soju because the addition of a fruit slushy waters down the strong alchoholic flavor. Me, Mark, and Reg with our Kiwi Soju. Love the crunchy seeds. 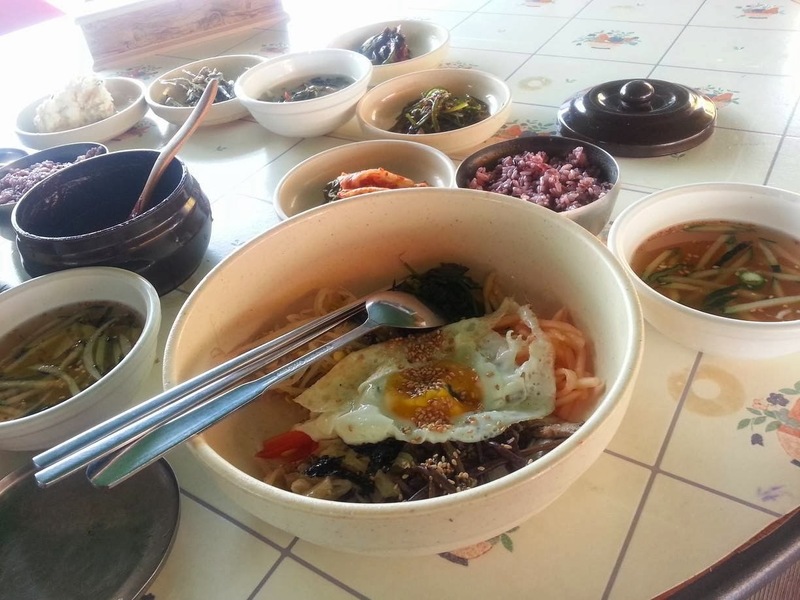 Bibimbap is rice topped with meat,vegetables, and egg, and comes with a spicy sauce to round everything off. Mix everything and this makes for a delicious meal anyday. As with most Korean dishes Kimchi jigae is spicy since its main ingredient is kimchi or fermented cabbage/lettuce. I just love it because of the flavorful soup and the soft, silky tofu that almost melts in your mouth. It tastes even lovelier topped on steaming rice. It’s the perfect comfort food for a rainy day. Since it was summer when I was in Korea I needed to cool off with this delectable bingsu. It’s shaved ice with an assortment of toppings and in this case we had red bean and green tea ice cream. The combination was not too sweet and it tasted quite earthy. Then there’s Korean fried chicken. I know what you’re thinking. I must sound ridiculous mentioning it in this list but this is not the usual fried chicken. This is commonly eaten as bar food but I’ll be happy to have this with a plate of rice for dinner or even on its own as a snack. It’s hot,slightly sweet, fried to a crisp, and spicy. Need I say more? Bulgogi is marinated beef that’s tender, flavorful, and succulent. It’s grilled on your table and comes with a soup that’s light and sweet. The meat is thin and so it doesn’t leave you with a heavy feeling after eating. Since kimchi is something Korea has a lot of, they have thought of countless ways to utilize this dish. Lo and behold one of those ways, the kimchi pancake or pajeon. Best eaten hot, the batter keeps the outer part crisp and the inside soft and juicy. The one I had at Busan had a unique special ingredient- cheese. It made the center gooey and rich. Yummy! It didn’t take long for us to notice the people in Jeju island carrying bottles which looked like oversized Yakult and our curiosity led us to the convenience store’s refrigerator. We discovered the drink was banana milk, and it was beside other flavors such as strawberry and chocolate. This sweet treat certainly brings out the kid in you. Though I’m not a fan of makgeolli or Korean rice wine, I have decided to put it on the list because of the adorable way they served it to us. 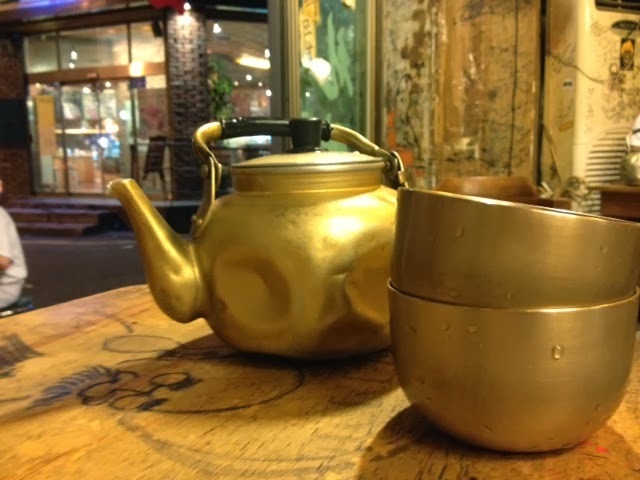 The beverage was in an old-fashioned tin kettle that had its matching cups. Give it a shot. It may not be my cup of tea but it could be yours. Samgyupsal is something I’ve had in Manila and so I didn’t pass up the chance to try it in Korea. I love how it’s cooked on a tabletop grill and towards the end of your meal if you still have some veggies, rice and pork left they will mix all of these together to make a tasty fried rice. Eat street food…and tons of it! To end every meal you’ll never run out of choices with Korea’s numerous coffee and dessert shops. And of course there’s always yummy Korean ice cream. Get your metal chopsticks on everything that looks interesting (or weird) to you. Bon appetit!